So when hackster.io tweeted about the following project, you can imagine the unfiltered excitement and fear with which I shared the link in the comms team Slack channel. 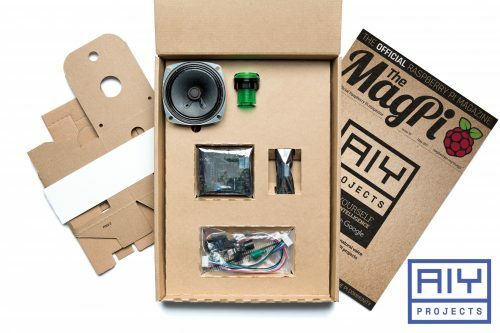 When we announced the Google AIY Projects Kit as a freebie included in issue 57 of The MagPi, I don’t think we realised how well it would do. OK, no, we knew it would do well. After we gave away a free $5 computer on the front cover of issue 40, we knew giving tech away with The MagPi would always do well. But the wave of projects and applications that started on the day of the release was a wonderful surprise, as community members across the world immediately began to implement voice control in their builds. And now, twenty months later, we’re still seeing some wonderful applications of the kit, including this glorious Porg project. 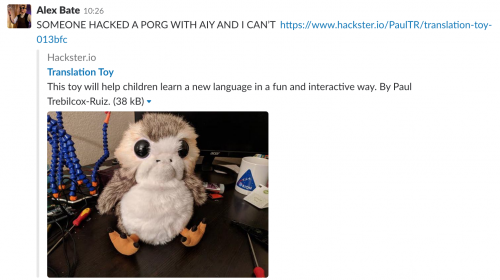 Hackster.io user Paul Trebilcox-Ruiz shared his Translation Toy project on the site yesterday, providing a step-by-step guide to hacking the motors of the Star Wars Porg toy so that it moves in time with verbal responses from the AIY kit. It’s all rather nifty, and apart from a Raspberry Pi you only need some wires and a soldering iron to complete the project yourself. …some wires, a soldering iron, and the cold-heartedness to pull apart the innards of a stuffed toy, Paul, you monster! Uploaded by Paul Trebilcox-Ruiz on 2018-12-10. As soon as Paul realised that the Porg’s motors would run if he simply applied voltage, he extended the wires inside the Porg with the help of jumper leads and so attached the Porg to the GPIO pins on his Raspberry Pi. For this setup, I hooked the two speaker wires from the Porg into the speaker connectors on the HAT, the button wires into the GPIO pin 24 and ground connectors under the ‘Servos’ heading, and for the motors I needed to hook up a relay for a 5V connection driven by the signal off of GPIO pin 26. The microphone that came with the AIY Voice Projects Kit was attached to the board using the pre-defined mic connector. Then Paul wrote code that uses the AIY kit to translate any voice command it hears into Spanish. Porgs were introduced into the Star Wars universe as a means of hiding the many puffins that traipse the landscape of Skellig Michael, the location used for filming Luke Skywalker’s home, Ahch-To. Bless you. A group of Porgs is called a murder. A baby Porg is called a Porglet. And no, you can’t get a physical copy of The MagPi issue 40 or issue 57. They’re gone now. Done. Forever. But you can still download the PDFs. Kit. Lots of useful info. Please think of us when you add them to the main page. Rules indeed! Why, she only wants rules so she can break 'em.